August is national golf month! A full month dedicated to golf. Dedicated to the people who love the sport, to the athletes that compete in tournaments, to the designers who create all of the beautiful golf courses around the world, and to the professionals who grow and maintain the miles of amazing golf course sod, the foundation of this glorious sport. Arizona is known for its world-famous golf courses. In fact, there are over 350 golf courses in Arizona and more than 250 of them are in Phoenix. The Phoenix Open draws huge crowds from around the world and is one of PGA Tour's top events each year. While watching or playing the sport, many have often wondered what sets Arizona golf course sod apart from your typical backyard grass. For greens installations in Arizona, the best types of sod to use are ultra-dwarf bermudagrasses, Tifdwarf, and Tif Eagle. Ultra-dwarf bermudagrasses are some of the newest greens grass to be introduced in the United States. MiniVerde is a true ultra-dwarf bermudagrass for use on high quality putting greens. The top performer in a two year study by the USGA, it has an extremely dark green color, extremely fine texture, and is for use on high quality golf greens only. Tifdwarf was originally developed for golf course greens to provide a higher quality-putting surface than Tifgreen. 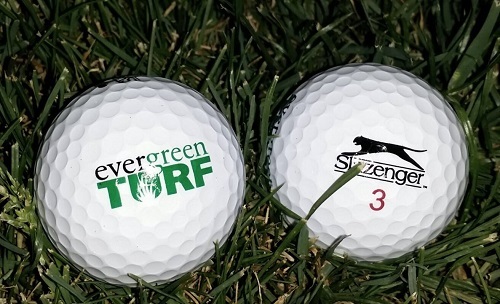 It has a finer texture and darker color than Tifgreen and makes an excellent putting green surface. While it can be used on residential lawns, Tifdwarf must be mowed with a finely adjusted reel mower or greens mower. TifEagle is the third generation of bermudagrass varieties developed exclusively for golf greens at the Coastal Plains Experiment Station in Tifton GA. Just as Tifdwarf replaced Tifgreen 328 as the standard for putting greens over the last three decades, TifEagle promises to set an even higher standard for the 21st century. Used on more golf courses than any other ultradwarf, TifEagle is the standard that all other greens are measured by. No two golf projects are exactly the same. Each course has its own set of demands and conditions. Evergreen Turf has years of experience in installing Arizona golf course sod, with special expertise in planting, turf selection, site preparation, and design. For fairway installations, Evergreen Turf offers Hydrosprigging, mechanical planting, and feature sodding as well as Fairway conversion. These are just a few examples why Evergreen Turf has become the preferred choice for golf renovation and construction projects. For more information, visit .